Realtors always say that your home needs to smell great before a showing. The idea is that comforting smells like fresh-baked bread or cookies will make prospective buyers feel warm and comfortable in this potential “home” and therefore be inspired to make an offer. And even for those of you with no plans to sell your house, I’m sure you wouldn’t mind your home spelling delicious and refreshing for your house guests all the time. In the real world, however, you probably don’t have time to whip up a batch of chocolate chip cookies, or knead out a crusty loaf of artisan bread. This is especially true if you’re cleaning like a maniac to get ready for those very same prospective buyers or house guests. So how can you make your home smell great in a pinch? In the fall and winter months, put on a pot of water to boil. Throw in a couple of sticks of cinnamon, and a few cloves, and let it simmer on low an hour before your showing begins. Your home will smell spicy and warm, like you’re getting ready for the winter holidays. You can also experiment with other ingredients too: Allspice, fresh ginger, vanilla and orange peels all work great as well. You can even use some of these frugal gourmet food and cooking ingredients! The baking soda uses are virtually endless. If your home is smelling less than fresh, sprinkle some baking soda on your carpets and sofas. Let it sit for 10-15 minutes, and vacuum it up. Baking soda absorbs odors, and will leave your home smelling neutral so that you can add a more pleasant scent. You can also sprinkle baking soda in your garbage can to eliminate unpleasant odors. This is actually a great strategy to use all the time. Vanilla is one of those scents that almost everyone loves. Make your prospective buyers and guests feel at home by leaving carefully hidden, open jars of vanilla extract around the house. As the alcohol evaporates, the pleasant smell of vanilla wafts out. Your kitchen is one of the most important rooms in the house. For prospective buyers, women make most of the buying decisions, and they’re often the ones who will look closest at this room. This means your kitchen must not only be sparkling clean, but it needs to smell great. Make sure your garbage disposal has a pleasant scent. Toss in some lemon or orange rind along with a few ice cubes, and turn on the disposal. This will eliminate stale or unpleasant odors. This goes for house guests as well, since the kitchen is usually a popular hangout spot at family and friend get-togethers. Burning essential oils right before a showing or holiday party is also an eco-friendly way to scent your home. Remember, however, that you want to burn oils that appeal to most people. Avoid strong, polarizing scents such as patchouli, sandalwood or ylang ylang. 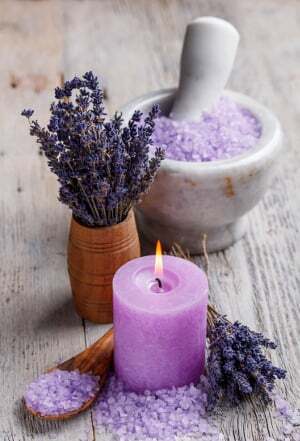 Instead, go with relaxing scents such as lavender or uplifting scents such as grapefruit or satsuma. You can also unobtrusively add wonderful scents to your bathroom by adding a few drops of essential oil to a cotton ball, and hiding them on shelves or by the sink. Want an even cooler idea? Add a few drops to your lamps’ light bulbs; when you turn them on for the showing, the heat will release the scent into the room! During holidays, many people love to smell the fresh pine scent of a Christmas tree when they walk in. If you’re going to put up a tree, choose a live one over an artificial tree. The wonderful scent of fresh pine will fill your home, and put potential buyers and guests in a holiday mood. If you don’t celebrate Christmas or want to save some money, you can still do something simple by putting up a simple wreath of tree trimmings, or even some fresh garland on your mantelpiece, both of which are great homemade Christmas decorations. These items also happen to be some of the cheapest local family dollar store items. Some plants like roses, eucalyptus, rosemary, and lavender release a wonderful fragrance into the room and set a good vibe for when you have guests. Plants also represent life and growth, so they’re beneficial to have around your home when they’re on the market. Of course you can save money with a home garden and grow your own plants as well. Choosing natural alternatives to commercial fragrances is a smart idea because many commercial scents are full of harmful chemicals we shouldn’t be breathing in at all. Also, natural fragrances will give you a truer scent, which is often much more pleasant to breathe in anyway!